Abstract: The annual CeBIT is drawing to close. 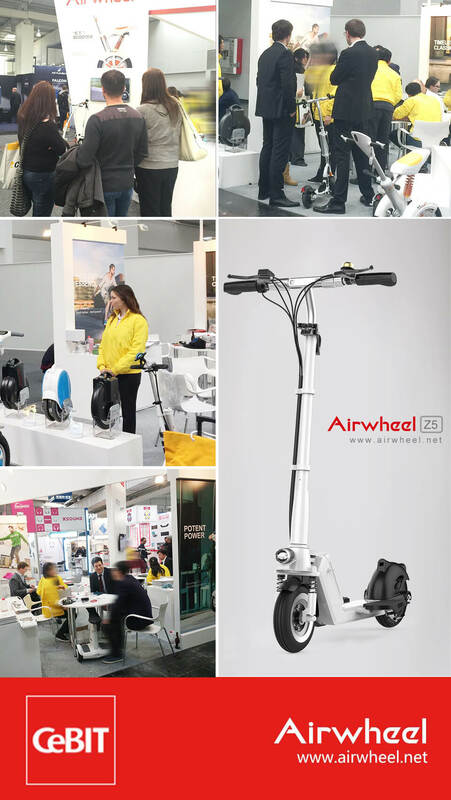 As the CeBIT was in full swing, Airwheel displayed its newest accomplishments at Hall 17-H06 involving four series of six brand new models, for instance the new series—C series, intelligent helmets, Airwheel S8 and S9 and Airwheel Z5. Today, the focus falls on Airwheel Z5 foldable electric scooter for adults full of R&D team's passion, energy and hard work. CeBIT is the largest and most internationally represented advanced technology development trend exhibition and trade fair, held annually on the Hanover fairground, the world's largest fairground, in Hanover, Germany. Today, the focus falls on Airwheel Z5 foldable electric scooter for adults full of R&D team's passion, energy and hard work, which deserves your attention. Brewing the Airwheel Z5 standing up electric scooter has gone through several stages until it is completed. No matter the long range for us to go to the farther place, the wider and wider standing platform or a screen to display the power level, the current speed and mileage, etc. Airwheel Z5 2-wheeled electric scooter will meet all the requirements. 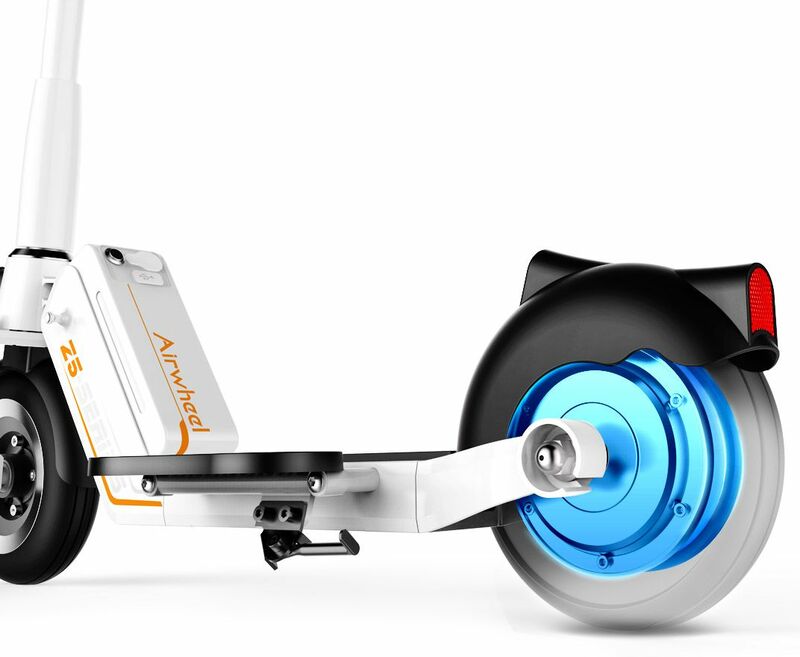 Airwheel Z5 electric standing scooter is equipped with foldable pedals. Fold and unfold, simple and effective, make riding conform to riders' habits and be more comfortable. In addition, after we have made many comparison tests, the front tire is pneumatic tire, and the rear tire is solid tire. Also, shock absorption system has been added into the front wheel to ensure the smooth riding of Z5. Out of safety, Airwheel Z5 is installed bell, headlight and intelligent brake taillight. Airwheel Z5 electric scooter for adults' battery pack is designed in modular. That is, riders can easily disassemble and replace the battery. It only takes a few seconds to finish it even if you have no operational ability. Moreover, the battery can be treated as a portable power source. Next：Is Airwheel S9 a self-balancing robot or a wheeled scooter?